This is the first nice n' purdy (guess that's kinda redundant) that I've done with my tablet. After this experience, I feel that drawing it on paper first works better. 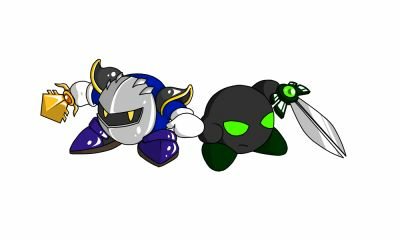 Woah, I find this quite Amazing, I love how Meta Knight's armor is shining. What wannabe said. Cool OC too, his sword reminds me of some type of gothic cross-thingy. Coolness. I like your oc, the sword looks like rabbit's ears for some reason... nah, it's the scissor-blade!! !